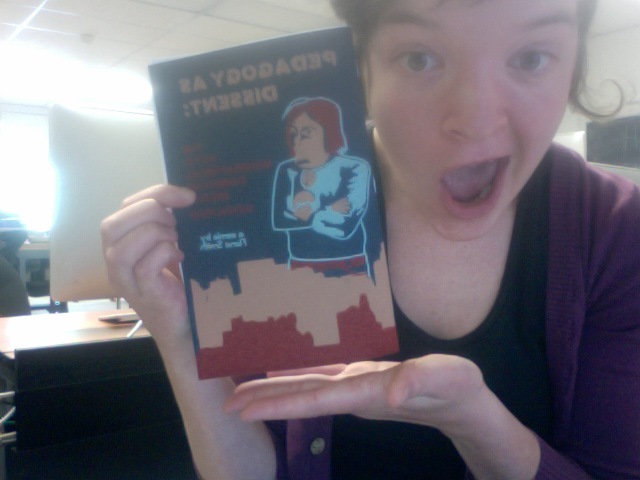 I proudly present to you Pedagogy as Dissent: The Autobiographical Comics of Nicole Schulman. Actually, I am in the process of printing them as we speak. This copy I have here is a “dummy copy” (aka I went through and found bloopers so I have to reprint parts) But, I can get copies to people as soon as tomorrow if you really want them. I’m asking $2-5 sliding scale, or whatever you can afford. If you want me to ship you yours, I’ll ask for $1 shipping. I am also super keen on trading- so if you’re into that, talk to me. And might I mention there is only 100 of them? So get yours QUICK! So proud of you and happy for you! Make sure you have a copy for me??? I would love to buy one from you! Always happy to support a fellow PWer. Can you accept payment via PayPal?